Again we were within the courtyard called the Cour Napoleon and took these high definition photos of a statue depicting La Bruyere by Lescourne, which is located on the Aile Colbert wing of the Musee du Louvre in the 1st Arrondissement of Paris. 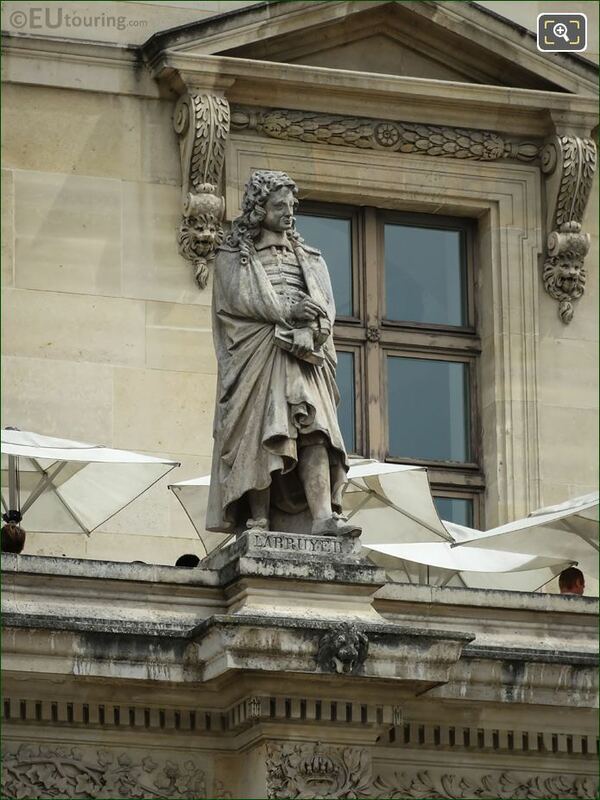 So this first image shows the stone statue of Jean de La Bruyere located on the first level balustrade of the Aile Colbert and as you are looking at the facade of the Palais du Louvre wing, it is positioned the fourth from the left hand side, and was put in place in 1857. 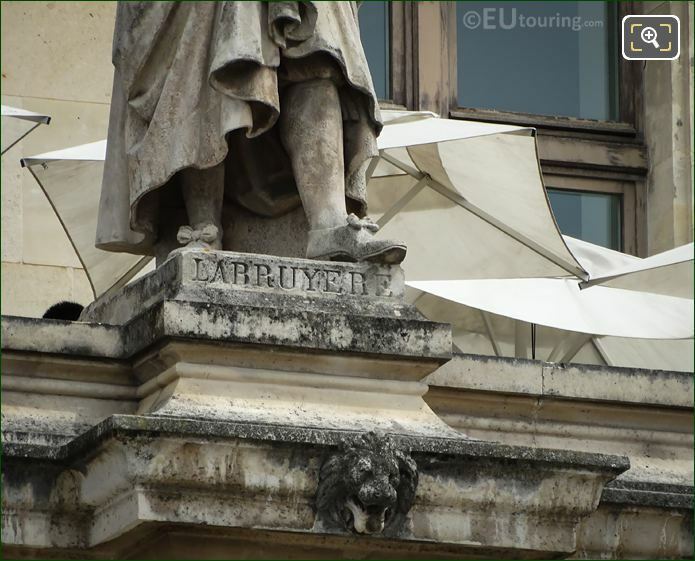 Now this statue of La Bruyere was produced by Joseph-Stanislas Lescourne, which is sometimes spelt Lescornel, and born in 1799 in Langres, he became a French sculptor and passed away in Paris in 1872. 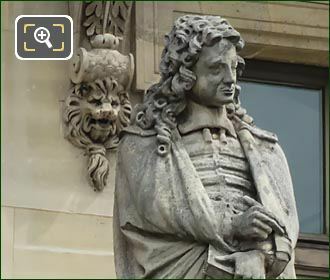 Yet this last close up HD photo shows the base of the statue with its name inscription, and this is dedicated to Jean de La Bruyere who was born in Paris in 1645, yet he always used to sign his name without any spaces so it would read Delabruyere. 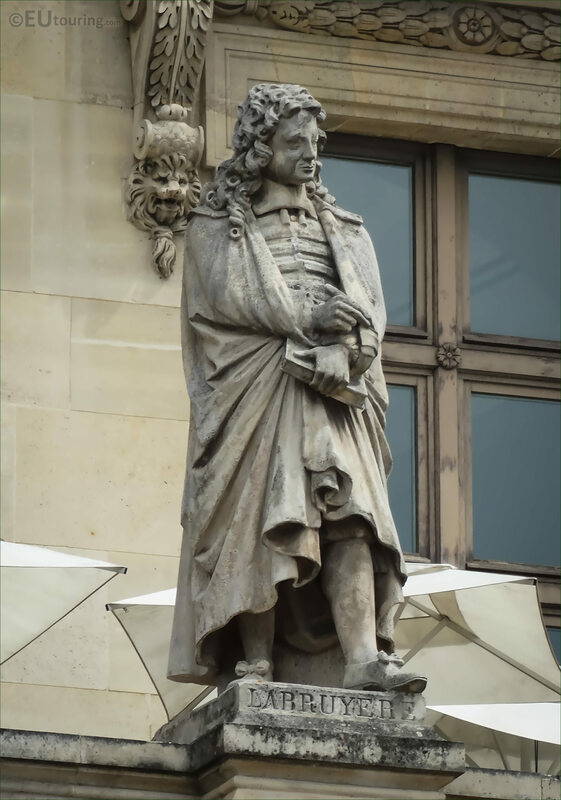 And La Bruyere became a French philosopher, moralist and a man of letters, in other words, someone in the literary field, who was an author, yet his book called Caracteres caused much controversy, bringing him many readers and many enemies, and years passed before he managed to get into the Academie Francaise, but he died in Versailles very suddenly in 1696, although his books were the first of its kind and are still recognised today.